This worksheet teaches kids to look closely at the illustrations in fiction texts to help them comprehend the story. Is your little learner as quick as Jack? Give her a great head start to learning basic addition with this fun nursery rhyme maths lesson! Read this classic children's poem, then draw a picture for it. Circle the rhyming words. Give your wild child this werewolf story to read this Halloween. He'll have a spooky story to share with friends, and get some reading practise, too! 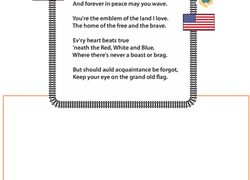 Get your child into the patriotic spirit with this fun song-based activity. Engage your students in retelling stories and sharing their thoughts with this fun worksheet. After reading a book independently, young critics will tell what happens in the story and explain why they would or would not recommend it. If one bridge falls down, how many bridges are left? None! Help your preschooler sort out simple subtraction with this nursery rhyme maths worksheet. Who is Behind the Wizard of Oz? Your child will identify the author and illustrator of the book by circling the appropriate names on the cover of the book. Use this glossary with the EL Support Lesson: Exploring Fictional Text.